The view south from the summit. 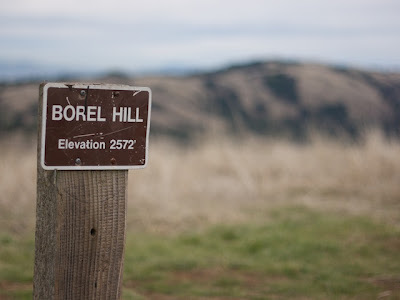 Borel Hill is the capstone of beautiful Russian Ridge OSP. 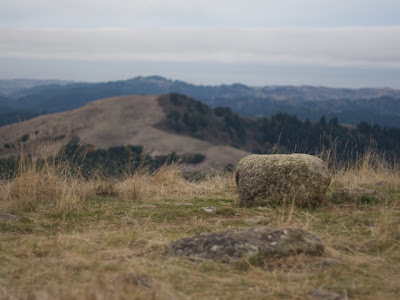 From the bald grassy summit views extend out over the entire Bay Area and its central location on the peninsula means its vistas are really unlike anyplace else in the Bay Area except perhaps Mission Peak & Mt. Diablo. Borel Hill can be approached from either of the two major parking lots in Russian Ridge but my preference has always been to use the Alpine Lake parking lot as it is quieter and gets away from Skyline Blvd rather quickly. I decide to visit on a weekday afternoon looking to explore the park a little bit and hopefully spot some wildlife. Mid-Fall is the best time to spot wildlife in the park when the summer grasses start falling down to make way for the fresh winter green grasses. During this brief time Coyotes, Foxes, and Bobcats don't yet realize their camouflage is useless. The Ancient Oaks trail following the contours of the hills. After getting away from the noise of Skyline Blvd and cutting deeper into the park along the Ancient Oaks trail the hikes really starts to come into its own. The trail traces along the contours of the hills, cutting in through stands of ancient oaks most of whom had lost their leaves at this point in the fall. Climbing up and away from the Ancient Oaks trail towards the BA Ridge Trail. 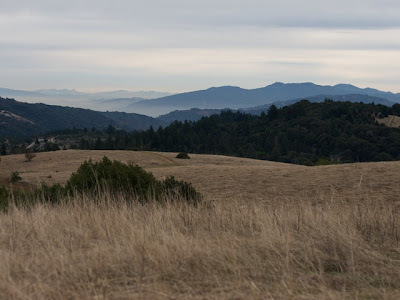 The views out, deep into the Santa Cruz mountains are endless with miles and miles of wilderness untouched by the presence of roads, or homes. To the north I could see the mountains tapering away towards San Francisco, and to the South their crest and the destinct radio towers of Loma Prieta. 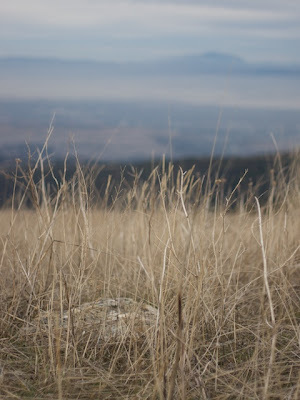 As I stared out over the terrain, admiring the green forest and the gentle ridgelines my attention was suddenly turned back to the trail by movement off to my left. Not 50ft. away was a Coyote hunting, oblivious to my presence. I watched for a few minutes as he pawed at the earth, searching for mice. Unfortunately he did eventually become aware of me as I started to pull my camera out of my bag and I could not get a photo before he trotted off over the ridge line. 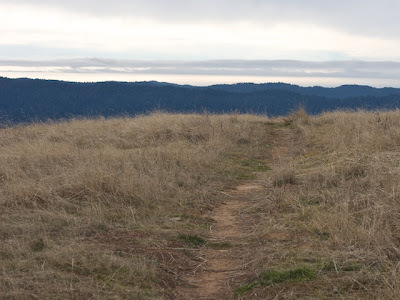 I took a quick right off of the Ancient Oaks trail and found myself back on the Bay Area Ridge Trail and before too long I was standing on the summit of Borel Hill admiring the scenery. I love the views here mostly because it provides a perfect surveying point for most Bay Area landmarks. Even on a poor visibility day I could see the skyscrapers of San Francisco the tips of which extended just above a sea of haze with the summit of Mt. Tamalpais above them. Mount Diablo was sitting straight ahead, with Mission Peak off to its right. Looking further south I could see Lick Observatory and Mt. Hamilton. Above the trees, just along the ridge of the Santa Cruz Mountains sat the large "sugar cube" (abandoned military base) atop Mt. Umunhum. Looking west Mindego Hill dominates the view. The waters of the Pacific Ocean can just be seen glimmering in the distance beyond the mountains. Off to the southwest I could even see the mountains of Big Sur on the other end of the Monterey Bay. I extended the hike just a little bit to the adjacent hilltop and surveyed the landscape a bit more from there before doubling back and taking the Ridge Trail back towards the car. On the trail in front of me in the distance I could see the same Coyote from before hunting around. As he scapered away a Northern Harrier swooped across my view, surveying the open grasslands for mice as well. 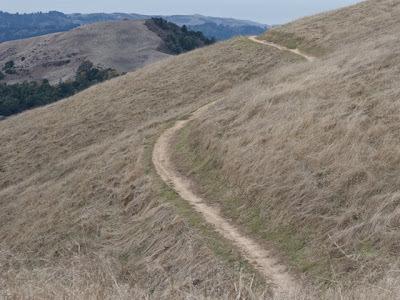 On the final turn, and with the car in view I even noted a deer grazing near the trail to cap off a short but wonderful stroll through Russian Ridge. 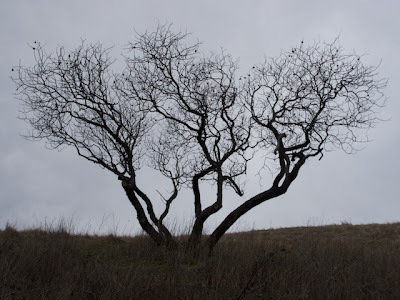 Ah, Russian Ridge is probably my favorite hike. Between the wildflowers in spring and the views all year, I come back again and again... I've seen coyote as well. What a great place! It's one of my favorites too always beautiful, usually fairly quiet. I feel like I'm discovering it all over again each time I visit.